autograph signer for 30-plus years! Remember Mike “Tiger Nut” Micho? He’s shining the spotlight on one of the greatest responses I’ve ever imagined recorded by a collector. 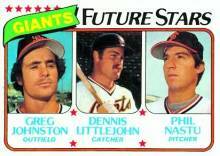 “Earlier this month I sent 2 cards to former Giants pitcher Phil Nastu. After nearly a month, I wondered if I`d get them back again, as usually he signs and returns cards quickly.Well, what I received back in the mail yesterday just floored me. It seems Mr. Nastu had signed the cards quickly and had sent them back out a few weeks ago. However, the Postal Service had totally destroyed the envelope (it was ripped in half) and the cards.This pile of waste was returned to Mr. Nastu as he had placed a return address sticker on the envelope.What he did for me was unbelievable! I was shocked that he cared enough to replace the cards, search the web for my name and addy, and send everything back to me (including the destroyed cards and envelope). Coming Friday: Phil Nastu replies, explaining his amazing kindness.